Home > Blog > Spread joy! December is the month of love, joy and family gatherings. We wish only love and happiness to each other, we give small and big presents – there is some kind of magical energy in the air. During this time of the year, you can find hundreds of ideas about what to give to your dear ones and make them happy. We won't write about all these best gift ideas for him and her, we won't give you any advice about what to buy and how to pack it as a perfect gift, but we will write about how to give something in this special month that you can't buy with money and direct it to ones who really need it. And no, you don't have to go at the end of the world to make a good deed, because all the people who need help live nearby. This December, we suggest you to give all your affection, love or some kind of present to poor families, institutions or organizations whose aim is to help people or animals. Here we bring you our suggestions, but we are sure you already know to whom you want to be this Christmas’ favorite Santa and make their holidays unforgettable. Whether poor, sick or abandoned, children always make our hearts melt, so we are always happy to give all we can to children. During December, numerous organizations collect donations for children. But, a good deed is not only a money donation to some organization. You can, for example, take or send some toys/games your children stopped playing with, already read fairy tales or overgrown clothes to the foster home or to some financially unstable family in your neighborhood. We are sure you’ll bring a couple of smiles into that home. The people we forget about the most are the elderly people. Even though they are at the end of their life expectancy, they are still very much in need of affection like all the other living beings. Sometimes it's enough to go with a smile and with a will for talk to make the people there happy. Most of them won’t even have a visit for Christmas, so make a good deed and make someone happy with a gift or just a warm conversation. Here are some easy tricks how to make a wrinkled face smile: if you have some skills in playing any kind of instrument, take it and sing a few songs in the nursing home, bring them some social games, hang out with them occasionally even after the Christmas holidays. Nowadays, each person should be environmentally conscious. Even though it maybe looks like one person can't do a lot, it is far away from the truth. By behaving more responsibly we can make a huge change. Because everything we do has a great impact on our planet Earth. The oceans and seas which we like so much and which make the most of our gorgeous planet, have become so endangered and polluted, that, if we continue acting like we do, we won’t have our blue planet anymore. Did you know that huge amount of garbage/plastic which is dumped into the seas and oceans, decomposes with time and reenters into our food chain? That means that what we actually eat our own garbage. We can prevent it and that’s why we support ecological organizations and associations. Involve yourselves into some kind of organization in order to help with the Earth preservation. There are many projects and organizations, but it’s up to you to decide how you’re going to include yourselves. Or if you just don’t want to participate this way, be creative! All garbage is not a waste. Include your imagination and try to craft new items from the things that would otherwise end up in the waste dump decomposing for hundreds of years. Make these gifts for your closest friends and family! Make a good deed and help abandoned animals. There are more animals in shelters each day, don’t buy pets, make a good deed and rescue or adopt abandoned animals. But, have in mind you should have adequate conditions and a will for taking care about animals. Helping animals doesn't necessarily mean adopting them. You can help by donating money, food or toys in your city shelter. Check out social media, volunteers working for animal shelters always have some kind of collecting things, so join them. That is one more good deed that will cost you only your time and a little effort. For real sailing lovers we would suggest to make a small donation to sailing club or school nearby. There are talented kids, but unfortunately not all of them manage to develop their talent as the club or parents don’t have adequate financial means to invest into the development of their talent. Sailing clubs always need equipment or money donation. Make a good deed and make a child’s dream come true! We believe that we have encouraged you to make some good deed. Good deeds do not only enrich people who receive the gifts, but they also fulfill those people who give. So, have you already chosen who you're going to make happy? Because, we did! Since we're talking about the happiness and joy of giving, we've decided to make you happy with our special extra Christmas discount for each reservation made till 27.12.2018. Check here which vessel you'll choose for your next summer vacation. Let this Christmas bring you peace, love and joy into your home! 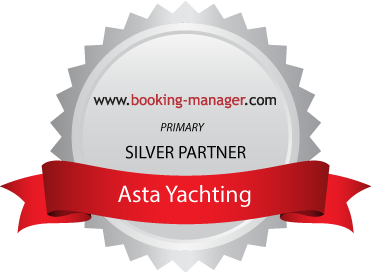 Merry Christmas from Your ASTA Yachting team!